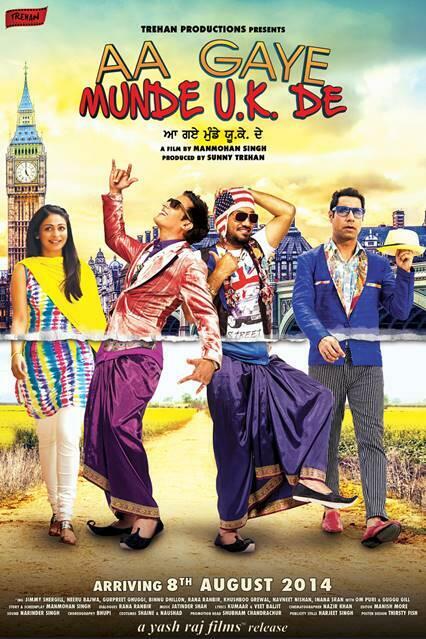 Powered by the big hit name of Yash Raj films, the latest Punjabi movie Aa Gaye Munde UK De has finally hit the theatres today on Friday. Being the sequel of Punjabi Movie “Munde UK De” 2009, which is the super hit movie of that year, now this newer installment has increased audience expectations than the prequel. Pre release response of audience was very positive for the movie and today when the film finally made its opening then similar effect could be seen in the performance. Aa Gaye Munde UK De opened much decently all over Punjab and all the fans were so enticed for the movie. There was good occupancy all over the dominated regions. Starring popular names of the Punjabi film industry like Jimmy Sheirgill, Neeru Bajwa, Gurpreet Ghuggi, Binnu Dhillon, Rana Ranbir, Khushboo Grewal, Navneet Nishan, Inana Sran, Om Puri & Guggu Gill, the film received nice public response on its first day of release and have maintained its reputation on the big screen. Sequel trend is started from Hollywood then Bollywood and now it is also a part of Punjabi Pollywood industry. Being a romantic comedy film, people have thoroughly enjoyed the movie and went along with their friends and families today. If we talk about the first day income of the film then Aa Gaye Munde UK De First Day Collection is around 1.1 Crore. Film has nicely performed and also the overseas response of the fans of Punjab industry was also great. Countries like USA and Canada are known for their good taste for Punjabi movies this time also they contributed good amount in the overall income of the film on its owning day. It is only the first day of release and we need to see the performance of Aa Gaye Munde UK De in the first weekend to arrive on any judgment about the film.